Today is Easter. Resurrection Sunday. I have never, actually, been much of an Easter guy. Sounds odd coming from someone who used to be a pastor. People say Easter is “Superbowl Sunday” for pastors. I always faced every Sunday like Easter. Every Sunday was a celebration of the resurrection of Jesus. I really approached it that way. I was thoroughly Christocentric and it is impossible to have your life, ministry and preaching centered on Christ and not have it find its natural center in the resurrection. Easter didn’t matter to me because resurrection was the breath in my soul. I lived and breathed it every day, every week. It was resurrection that moved me. Resurrection inspired me. 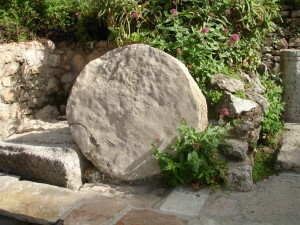 The stone rolled away that first resurrection day and two thousand years later, my own tomb was empty. Resurrection made me alive. At that moment, I was mortally wounded. I didn’t know it at the time, but the betrayer’s sword cut much deeper than I realized. It set in motion my death. It was a terrible infection that began to eat away healthy flesh and left a path of necrotic tissue. Inch by inch, I died. The tomb called to me, and with my last strength, I answered the call. The stone was rolled in place and death won. The faith that, for decades, was my life, was dead. Today is Easter. It is resurrection Sunday. At church, we sang songs about empty graves. We celebrated the end of death. I along with everyone else. But my own soul is dead. I want. I really want to live. But death is strong and this stone is stubborn. I am not trying to be overly dramatic. I don’t want sympathy or platitudes. Neither moves stones for me. So why am I writing this? I guess I spent my whole ministry opening the blinds on my soul so people could see me and know me—the real me–with faith and faulters. Authenticity was one of the marks of my ministry and of my life. So I am tipping the blinds a bit one more time. I had a time in my life when I wasn’t sure I believed all this God stuff. This is not that time. I believe. I believe it all. I believe in Jesus. I believe He sits at the right hand of God. I believe He loves me. I believe He died for the sin of humanity. I believe the stone was rolled away. I believe Jesus was resurrected. I believe. The problem is not one of belief. The problem is, I am dead. The tomb is sealed. The stone will not roll away. I don’t like being dead, so I am going to begin a journey of faith. A journey from death to resurrection. I am trusting there is a way to move the stone. Here is what the journey is going to look like. I am going to reacquaint myself with Jesus. I am going to wander through one of the Gospels like I did when I used to preach. I am going to watch and listen to Jesus. Over and over, I am going to ask Jesus to move the stubborn stone on my tomb. Along the way, I am going to try to journal the journey—reflecting on the life of Jesus and on my own soul as well. This is going to be a long journey and I would rather not go alone. I am going to ask a friend to commit to walk the journey with me. I am going to ask him to hold me accountable to write and think and pray. But there is room for more on this path. I would love for several people to go on this journey with me. I can use all the help I can get and it might be valuable for you as well. This blog can provide a way for you to join me. If you want to walk beside me—maybe you are on the same journey, or maybe you love me and want to help me find my way out of this tomb—take some time and read my blog and interact with the ideas. Write comments. Share insights. But mostly, just let me know you are reading. That will help me. That will encourage me. This stubborn stone needs to move. I am hoping to begin this journey soon. Stay tuned. Thanks for reading. Derrick, I have been spending weeks in the gospels and have found some kind of quickening and refreshment for having been focused on Jesus’ words and ministry. I would love to journey with you, for your sake for sure, and for mine. Thank you for being so real and for making yourself vulnerable. May this space invite more of the same from everyone who steps in. I am walking this journey as well. Sometimes a few steps ahead, sometimes behind. Sometimes I’ve simply fallen off the journey. Rest when your feet hurt. Change your shoes when necessary. Use a map. Watch for me. I’m sure I’ll see you from time to time. I will be reading and praying. I have missed your insights and thoughts. Thank you for lettingme be a part of your journey. I have my own thoughts.. because sometimes even though the stone might be rolled away, we don’t want to accept the job he wants us to do….. Thanks for sharing your experience and quest Derrick. I’ll be following and perhaps joining your study of the Gospels. Praying that the wounds you suffered by man is healed by the love of our lord Jesus Christ. Might I recommend a review of Romans 8. I have a particular fondness for Romans 8:38-39. I’m with ya Dude… Dead hoomans walking with God. The Lord loves us, thank goodness. Thanks for the direction, Ron. Of course I’ll be on the path with you and your words will encourage so many. I’ll rejoice in your journey! I will pray daily for you. I’ve been waiting…. Thanks for the opportunity to partner with you again. Where are we starting? What are we reading first? I’m in. I will be reading and following this journey. It will be great to hear your thoughts and insights again. I will be reading! * hugs* old friend!! I read them all! I would love to be included. I will be watching for more to come. Hello pal. Sorry to hear of your plight. I didn’t think you could be crushed much worse than when we rode our way to cornerstone. Jobe made it and so can you. When I am down I look @ nature and Gods creation. Why do the geese go north in the spring and south in the winter. How does a baby goat know where to get his first meal. Because God is the master builder and always has a plan. Trust God and he will roll your stone. I will read along and try to keep up. I will gladly walk the journey with you my friend. Please add me to a notification of when you post. My spiritual journey has been — and continues to be — a series of peaks and valleys. Love the peaks and the knowledge that as we “climb higher” the view changes. And my valleys can be so deep and dark and fearful — sometimes with no light to guide me. I look forward to your blog entries, and I hope they will help me remember that I am a child of God — and all that means. Derrick, you are quite a good writer. While my journey has been different, I too can relate to the deep pain we experience through ministry … and still feel the pull of Christ and his Kingdom. Blessings to you, Wendy and your family.